Windward School maintains a close community partnership with Mar Vista Park. A few months back, while coaching Cross Country at the park, Associate Athletic Director Frances Jones came across a set of neighbors performing Tai Chi in the park. She struck up a conversation with the group and quickly learned more about its members. 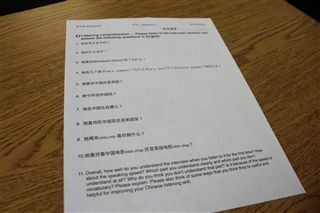 Frances reached out to Mandarin teacher Candice Chiang to see if she'd be interested in somehow integrating the group into her lesson plan. What resulted was a rich cultural learning experience for Windward's students. 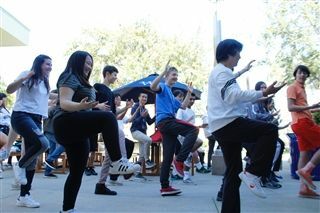 On Wednesday, March 9, the Daichi Group came on to campus to teach basic Tai Chi moves to Mandarin 2 and Mandarin 3 students. 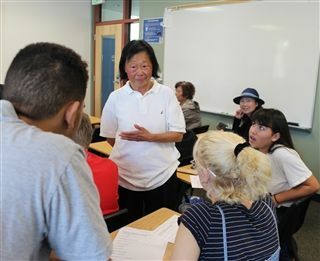 After the demonstration, students went back to the classroom and interviewed members of the group and learned more about their individual stories. "Valuing our community and its members is vital as we continue to support the relationship we have with the Mar Vista neighborhood. Having the opportunity to tie language and culture through dance was an experience for both the community members and our students. There are so many opportunities where we can explore other cultures right in our backyard. Building relationships and learning about new cultures was a great way to tie in our language program with our neighbors," said Frances.